Funny thing is that I had never had a bagel prior to moving to the US. I am sure you can find them in France but my catholic provencal background probably shunned me from knowing this delicacy. I made up for lost time, believe me! I love how versatile they are. We eat ours with sweet spread sor breakfast, pile halves with pizza topping, or use mini ones with snoked slamon and mascarpone for little munchies with friends. I like having a bagel around the house even if I won't eat all of it...it's bumpy smooth belly brings me comfort...I know I am weird...but if you know me you kow I am also the one who makes bread like crazy just for the smell and feel of it, even if I don't eat that much. Herbes de Provence, poppy seeds, bacon, sesame seeds, fennel seeds, caraway seeds, coarse demerara sugar, cheddar cheese and maldon sea salt. Our challenge was to follow it without changes so we could all compare notes. Seems like we all pretty much experienced the same things. 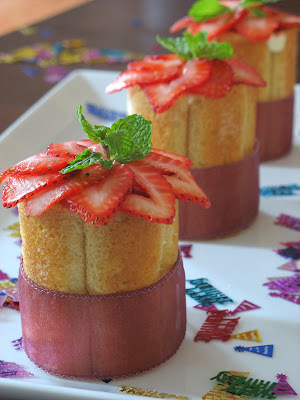 For more reports, you can click on the side bar blog roll for Daring Bakers. All this to say that I had a blast making these and would make them again. Actually I did make them twice, just to see if the recipe would end up differently if halved. A few observations to keep in mind if you decide to try them: the dough was wickedly rising fast and high. Kneading does not take that long, about 8-10 minutes but do not skip this step. It's good for the nerves and it really helps the texture of your bagels in the end. 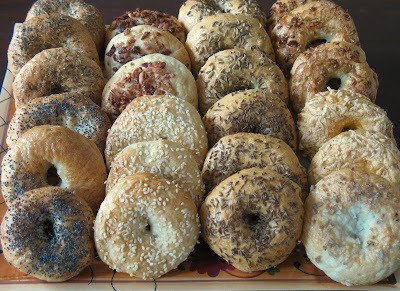 When the time comes to shape your bagel, divide the dough in half and refrigerate the batch that you are not working on. The recipe mentionned that the bagels would sink to the bottom of the pot and then rise and float in the water. My first batch yielded about 32 mini ones, and only 10 sank, the rest nagged me by floating their little merry way ... Floaters or sinkers, they still tasted the same. I used all of the flour measurement, kneaded appropriately, respected rising times and still floaters. Same issue when I made them again a couple of weeks later and halved the recipe. I decided to go for the poke method to form them, and I had to push a rather large hole in the middle as the bagels had a tendency to swallow it back up upon their rising before their little trip in the water. Thanks Jenny and Freya for a fun challenge. 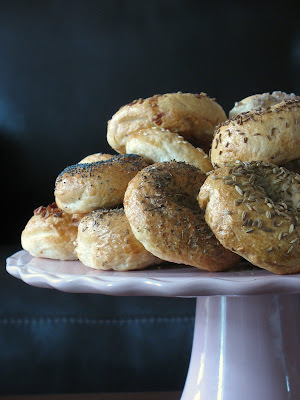 I will keep the recipe and make it again with some tweaking....I still want to make my bagels sink! 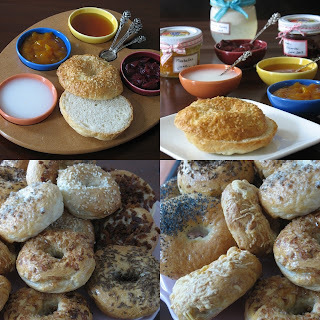 Since we eat them mostly at breakfast and since we are a mostly sweet household, these are some of the spreads we have with our bagels: mirabelles jam (yellow plums), cherry preserves, coconut honey and wildflower honey. Since I have so many bagels, I have been using them for mini sandwishes also with a spread of chive cream cheese, sprouts and some turkey slices. I have been craving my grandmother's tart ever since I saw the first apricots at the store a few weeks ago. Well, actually I crave it all year long and while it is quite good with quality canned apricots, there is of course nothing like fresh, velvety and fragrant ones. We don't really need a reason to indulge in our cravings. By definition, giving into them is giving into reckless abandon of our senses and indulging in what brings us comfort and joy, as temporary as it is. 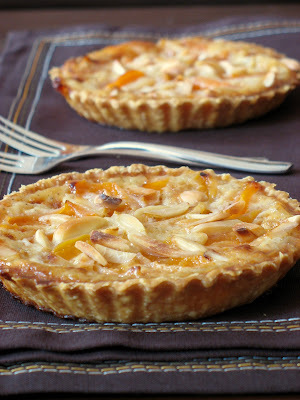 When Jennifer announced this month Sugar High Friday, my brain started racing towards many a childhood favorites (and made me wonder if I did not live in a state of perpetual craving), before the only obvious dessert was Mamie Paulette's apricot tart. It would also give me the opportunity to spend some time with my memories of watching her make the dough and filling countless times with the same love and care. Then a few days ago, Ivonne wrote about her Nonna Pia and shared fond memories of her life and approach to cooking. I think that Paulette and Pia would have been great friends if given the chance. They both had six children and both knew how to turn the simplest ingredients into scrumptious dishes. I left Ivonne a comment mentionning Paulette's apricot tart and she emailed me suggesting that I post about it and share my memories. She also threatened to bug me until I did...! Well, here it is my friend! I have talked about my grandmother many times before, always mentionning her apple or apricot tarts and always making something else. 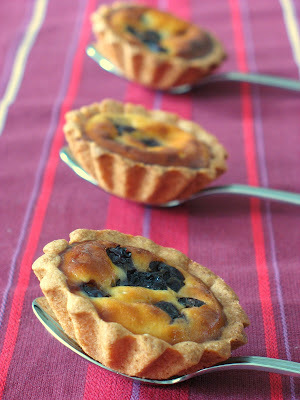 Her tarts were so simple, yet so absolutely delicious that she knew to keep us happy by always having one ready. My grandparents' house has always been the place of gathering throughout the week and especially on sundays. Four out of six children ended up living within close proximity and thus started the sunday tradition of "coffee and tart" around three in the afternoon meaning if you cannot come for lunch, try to make it for dessert. Even as a teenager and young adult, I would always try to make it for tart...especially if a paper or thesis was calling my name! There was something so soothing and comforting in seating down with her and my grandfather to sip coffee, talk about the family, the neighbors, their garden, and eat pie. 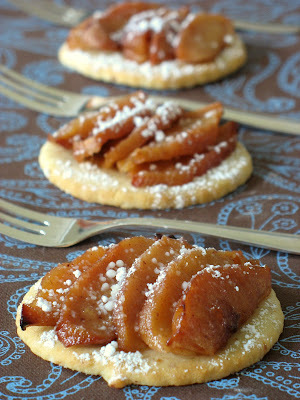 There is even a funny anedocte associated with her apricot tart. At some point her eyesight got worse and worse, and she often made two pies, freezing one in case she would be too tired one weekend to make a fresh one. We were all gathered at the dinner table one sunday evening and when dessert time came, she asked me to go fetch the tart warming up in the oven (you know, so that the ice cream on top melts faster!). I came back trying to hold the tears of laughers streaming down my face...she had mistakingly put a quiche in the oven and not the tart.... ! Everytime I make quiche or tart, I think about that day and immediately look up at the sky and whisper "Love you Grandma". Place flour and sugar in the bowl of a food processor, and process for a few seconds. Add butter, and process until the mixture resembles coarse crumbs. Add the ice water then the egg yolk, processing just until the dough holds together. Do not process for more than 30 seconds. Preheat oven to 350F and blind bake the tart shells: roll the dough out on a lightly floured surface, lay into tart shell, cover with parchement paper or foil, pour dry beans or pie weights on top and bake fro 15 minutes. Let cool before proceeding with the apricots. Whisk the sugar and the eggs until pale. Slowly add the milk and creme fraiche and whick until combined. Add the extracts and ground almonds and whisk one more time. Slice the apricots, lay them in the bottom of the tart. 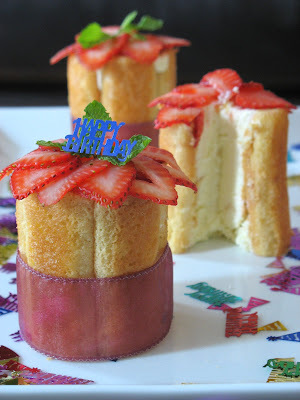 Slowly pour the batter on top. Sprinkle some slivered almonds on top and bake until the custard is set and the tart is golden brown. I wish I could remember when I first heard about the Vietnamese coffee filters you see in the pictures. Was it in a magazine, on a food show on tv...dunno... All I know is that I thought they would be a great piece of conversation when time came to serve coffee to my guests. I love having friends over and to me plating foods in fun or interesting dishes is as much important as making or eating it. These work like mini French coffee presses, you just set them up on top of your cup or mug, pour some coffee into them, screw the lid and let the water drip. I have had them for about five years now and I use them constantly not only because they are fun, but they give the best coffee too. In France, Asian food is very different than here and I remember going to more Vietnamese restaurants than Chinese or Thai, and as a kid I would automatically go for ice cream or fruits and not coffee to ed my meal. My parents would always end up their meal with a little cup of sake, the ladies' cups would have a little flower in the bottom and the men's the picture of a naked lady...don't ask me why, but we (the brother and I) thought that was truly hilarious especially around 7-8 years old. Anyway....no Vietnamese coffee in all my childhood years of eating Vietnamese foods...It was not until I got here to the US that "Roomie" introduced me to Vietnamese coffee and I have been hooked ever since! If you are a coffee drinker what not try this sweet but light combination of sweetened condensed milk topped with Vietnamese coffee or if you can't find it, a French roast or a coffee with chicory. A couple of weeks ago, Old Chef and I were playing our favorite game: come up with new menu items for upcoming catering functions. B. thinks it is hilarious to watch us elaborate because we seem to have a language of our own, a mix of French and English, words flying across dishes and piles of notes, sketches of towering concoctions of sugar, butter, cream, fruits, nuts,... We love doing that over a good cup of coffee at the end of an event or after a long day on the phone placing orders and visiting purveyors. I knew he would like Vietnamese coffee as much as the filters necessary to make it and after a cup or two, we had come up with a couple of different desserts featuring it. These tartlets and ice cream are one of them....yes, you'll have to stay tuned for next week's second installment because today's dessert is not the one we decided we would keep in the end. This one was not bad but the white chocolate ganache was overly sweet. Since we try to be cost effective, and we foresee people leaving half the tart on their plate even if we make them smaller, we decided to make another version. Don't get me wrong, the flavors are great: coffee, cardamom, white chocolate, dark chocolate, and work well together but the white chocolate is the overkill with a condensed milk sweetened Vietnamese coffee, no matter how powerful. Whisk egg yolks in a large bowl and set aside. In a medium saucepan over medium heat, heat the milk to scalding with the groud coffee. Pour 1/3 hot milk over yolks, whisking constantly until well combined. Pour in remaining hot milk, then pour mixture back into saucepan and return to low heat. Stir constantly until mixture has thickened enough to coat back of wooden spoon. Remove from heat and stir in the condensed milk. Strain in a fine mesh colander to filter out as much of the coffee grounds as possible. Let cool to room temperature, cover ad refrigerate until completely cold. Freeze in an ice cream machine according to manufacturer’s directions. Place hazelnuts and 2 tablespoons confectioners’ sugar in food processor. Pulse until the nuts are finely ground. In bowl of electric mixer fitted with paddle attachment, cream butter, cocoa powder, ground nuts and salt on medium speed until well-combined. Slowly add remaining powdered sugar and flour and mix well. Slowly add eggs and mix until incorporated. Shape dough into a ball and flatten into a disc. Wrap with plastic wrap and refrigerate overnight. When ready to use, roll in between sheets of plastic wraps and cut out rounds to fit 4 4-inch tartlet molds. Prick with a fork and bake at 350F for 15 minutes. Let cool completely. Set the white chocolate in a bowl. Heat the cream with the cardamom until very hot. Pour the cream over the white chocolate. Let sitfor a couple of minutes and stir until completely smooth. 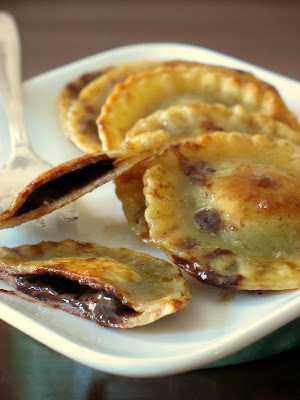 Pour into the cooled dark chocolate tartlet shells.and refrigerate until set. To plate: make yourself a nice cup of coffee and serve the tartlets with a generous scoop if ice cream. Note: I was going to post this tuesday night but decided to do a little roud of my favorite blogs and went right away to visit my girl Anita at Dessert First and stumbled upon her latest delectable creation: Chocolate and Vietnamese Coffee Tart ! I am not surprised anymore when Anita, Bea and I share a dessert with you guys and they are eerily similar in concept or taste (and believe me it has happened more than once! )....all 3 of us are Taurus! I can't believe I have waited this long to make "canneles" (ka-ne-lays), just because I did not have the proper canneles molds. This specialty tea cake from the region of Bordeaux is one of my all time favorites but when I moved to the US, those little shiny molds where not part of the "must have" items I took with me. Literary folks, I moved here with 2 suitcases full but not much from the home country. My parents have been filling the gaps and fulfilled my nostalgic demands with every visit they make but very soon after my moving here the craving started to hit really bad. To fix my sweet tooth, I started baking them in muffin tins and small ramequins but I always hesitated posting about them, fearing "canneles" traditionalists and purists woud give me the evil eye and roll their shoulder in disappointment. Well, that was until I read this post by Melissa at The Traveler's Lunchbox. It made me realize that if something is good, does it really matter if the shape of the final product is different than the traditional? Isn't respecting the ingredients and baking method the most important? How to describe a "cannele"...hmmm...that's kind of a tough one. Dark but not burnt on the outside, soft and chewy on the inside. The batter is like a thick crepe batter turning into a cake right before your very eyes while wrapping your senses in an intoxicating aroma of vanilla and rum. Do not wait to get the right molds to try these as the one you eat quickly becomes two and three and pretty much you forget they were supposed to make it to the neighbors' house (oops!). When the time came to make these the other day, I could not find my little blue notebook with all the recipes I had gathered before I left France and after looking at many recipes and variations for canneles, I finally settled on this one which gave me the most wonderful little morsels. In a bowl, mix the eggs, egg yolks, sugar and vanilla and whisk until foamy. Slowly add the rum and flour. Add the milk slowly and whisk until smooth. Pass it through a sieve if neessary. When the batter has rested, preheat the oven to 425F and divide it evenly among the muffin tins, generously coated with cooking spray or well buttered. Bake for 45 minutes to an hour. If you can wait, you will find that they are better the next day. Apologies to all "canneles" purists but what is a girl to do when the cravings strike and cannot wait? It is probably no news that I love berries, lemons, and mascarpone, but what I love when two bloggers give me the chance to put them together. Lisa from La Mia Cucina and Kelly from Sass & Veracity got together and concoted a Salad Extravaganza event in their quest to shrink their hips and thighs. I first thought about doing a simple fruit salad with a drizzle of honey and lemon juice, maybe a dollop of barely sweetened whipped cream. However, after several email exchanges with Lisa and her desire to keep the taste and bang factor while watching what she eats, I wanted to share with her that one can keep that "wow" factor by using regular ingredients but decreasing the portion size. I too have had my battle with my thighs and over the years I have found out that they respond well the old "quality over quantity" phrase (although I have been known to have my cake and eat it too!). I first tried yuzu in a tart purchased from the amazing pastry chef Sadaharu Aoki while in Paris last Christmas. How to describe the taste? Sometimes it is like a grapefruit or a perky tangerine in your mouth, sometimes it has a lemon kick to it, the kind that makes you gums go "ouyee" overall it just is plain good if you love citrus! I cannot find fresh yuzu fruits here but thanks to the internet the juice is easily accesible. 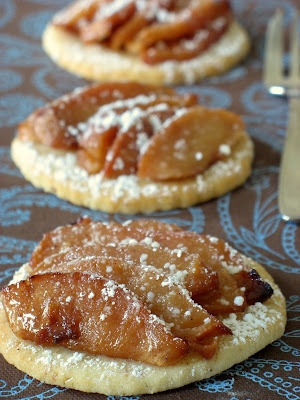 These "verrines" are a dessert we have often as it is light and tasty, easy to put together and extremely refreshing. Don't tell be but I even enjoy a few spoonful in the morning before my run. With the yuzu juice, I make a simple (lower calorie) curd that I layer with a mascarpone cream spiked with lemon zest. The berries don't really need anything else as you dip your spoon and mix them with the creams. Combine the sugar and juice in a saucepan, and bring to a simmer. Beat some of the yuzu mixture into the eggs to temper. Scrape the mixture back into the saucepan and cook stirring constantly until it thickens up, about 5 minutes.Strain and refrigerate, covered with plastic wrap until ready to use. Mix all the ingredients together and keep at room temperatue, it will be easier to layer. To assemble: layer the yuzu curd and mascarpone cream in glasses or cups and top with a generous amount of the mixed berry salad. Hope you enjoy it ladies! Why were these cute little tartlets a steal? 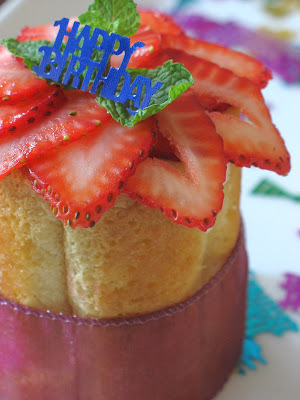 As soon as Meeta posted the round up for her Monthly Mingle Birthday Bang, I started going through each post, each time more tempted than the next, (such beautiful creations), until I stumbled upon Asha's Strawberry Yogurt Pie. I don't particularly like baked or cooked strawberries, unless in jams or preserves, and I had an abundance of blueberries and plenty of yogurt, so the decision to include them into our sunday brunch spread was easy. Old Chef liked them so much that he wants "plenty" , which in his world means anywhere from 100-200, for an event next week....arghhhh! The pie is easy to put together, has great flavor and very versatile as far as ingredients used. I made mini tartlets instead of mini ones since we already had plenty to share and the cute factor certainly helped make the table a little bit more inviting but feel free to make one large pie. Either way you will not be disappointed! In a food processor, combine the butter and sugar. Add the egg and blend well. Combine the flour, lemon zest and baking powder and mix them into the wet ingredients to form a soft dough.With flour-dusted fingers, pat the sticky dough into the bottom of a pie pan or individual tartlet molds. Push the dough up to cover the sides of the pan. Refrigerate until you make the filling. 2 cups blueberries, fresh or frozen. Mix all the filling ingredients except the blueberries until smooth. Put the berries into the pie shell or mini ones and gently pour the fillings so the berries are coated and evenly distributed. Bake for 50 or 60 minutes, at 350 until the crust is lightly golden and the custard has set. For the mini ones, 30 minutes were plenty. Pink macarons, ok...but what is "tagada" you may ask. "Fraises Tagada" is one of my childhood favorite candies, and it is pink, and it is good and it makes me giddy like a kid again. I just like saying the name over and over! Since I introduced B. to the line of Haribo candies, the licorice rolls and "fraises tagada" have become his favorites, so it was no surprise that when we came back from Christmas with my parents in France that we had several bags tucked away in our suitcase. I thought we had gone through all the stash when I found a bag that had fallen behind my pastry box. The candy is like little pink pieces of strawberry flavored marshmallows. I know I said May was the month of things pretty and delicate but when you read the reason why I made these, you will understand. I started thinking about these ever since I saw Requia' post about a pink event to support the fight against breast cancer. I wanted to make them very pink and very giddy...Well, yeah I am weird: just looking at them makes me happy, feels me with hope and the color even calms me down. 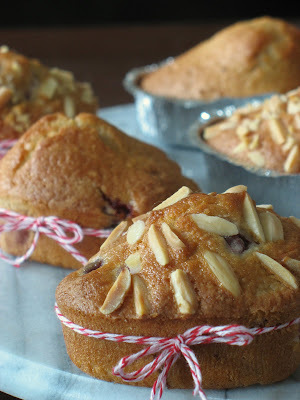 I put it in the back of my mind until Bea's savory pink "verrines" reminded me it was high time I cranked up the mixer. Cancer makes no distinction of gender, reace, age and social status. We live with cancer, know somebody with it and hold the hands of too many friends going through the same thing. Cancer is global, cancer is universal...so is hope, so is the fight against it. A few weeks ago I participated in Barbara's yellow event for LiveStrong Day, and today I want to pay tribute to all the women and men devasted by breast cancer. I also wish to pay tribute to my grandma who found out in her early 8os (yes, you read right) that she had breast cancer. 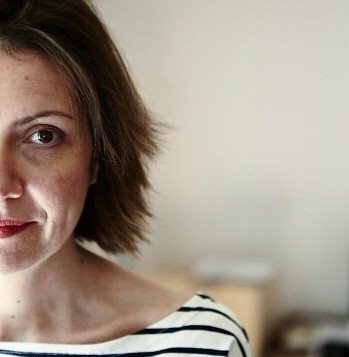 When her doctor suggested biopsies, exams, breast removal and what not, she looked at him straight in the eyes and said "you're crazy...let me live". AH!!! And there you have it, my grandmother in a nutshell...and the essence of the way I lead my life. She passed away at 93 from a cancer that had invaded her tiny frame but never her spirits or her will to live. Now, and before you all start to yawn...These are just plain macarons shells colored with neon pink powder dye, with different pink sparkles and filled with a "fraises tagada" and white chocolate ganache. For the macaron shells I followed a different recipe than my favored Italian meringue one, and with good results. The first tray looked like the meringue was not folded enough so I gave it a couple of extra turns and the remaining tray turned out beautiful...I think I could get addicted to this lazier method!! 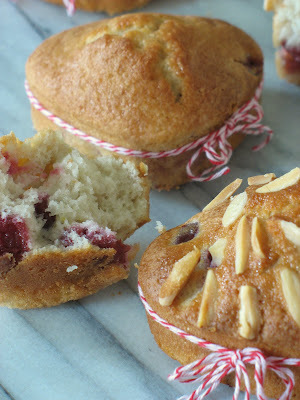 In a food preocessor, grind the almonds and powdered sugar togther to make sure they are really fine. Pass through a sieve and set aside. Note: when I process them very fine, I usually skip the sieving step and just break any lumps with my fingers. Start whipping the whites on low speed to break them up, and slowly increase as to obtain a soft foam. Slowly add the granulated suage, one TB at a time until the meringue is tight and glossy. Stop the machine and fold in the coloring and the almond/powdered sugar. The batter should flow like magma. Try a spoonful on a plate. The little peak created by the meringue should flatten when tapped on the counter top. Line 2 baking sheet with parchment paper and preheat the oven to 300 F.
Fill a pastry bag with the batter and drop rounds on the baking sheet. Add the sprinkles. Let dry for 30 minutes and bake for 10-12 minutes. Once they are cooled. Fill each with about 1 Tb. of the ganache. Heat the cream until hot. Drop the chips and candy into the cream and stir until all are melted and come together. Let cool. How is it that every time I turn the computer on and spend more than 30 minutes looking at the screen, my "favorites" box ends up being full of luscious, simple, adventurous, down to earth recipes that I know I won't have time to get around? How is it that everytime I hit the market, my produce guy, Sunny, hands me a box of the best he's got around and charges me pennies for it? Maybe because he knows I will bring you a share of whatever I end up making. Sunny knows my love for berries, blood oranges, lemon, all things tart and puckery, and naturally of all things "cherries". He tried to compete with Beverly for all things local and homegrown but when it comes to cherries, he knows one tree is not enough for me...so he brings me case after case. Every night this past week, I sat down at the dinner table, covered in old newspaper and I pitted cherries, pound after pound. I have preserved, jammed (oh yeah, I am cool like that), jellied, pickled and froze 30 pounds so far. Crazy? maybe, I don't know...I see red everywhere...If I see one more pit I might scream...I think people wonder why I paint under my nails...! But there you have it: first installment of a very cherry summer to come (oh, yeah , I am funny like that) in the form of mini cakes inspired by 3 different recipes I had bookmarked from other blogs, and as a Taurean, not quite capable of making up my min,d I decided to combine all three and make my own little tambouille (French slang for nosh). In a large bowl, whisk the eggs, sugar, melted butter, coconut milk and extract. Sift the flour, baking powder and salt. Add to the wet ingredients. Fold in the cherries. Sprinkle with almonds. I wanted to use coconut but ran out after another baking project. 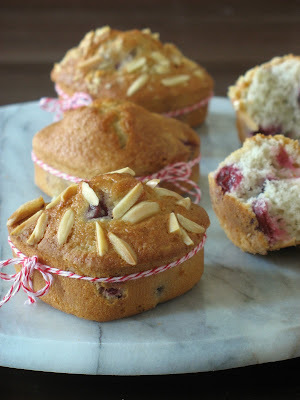 Divide between muffin tins lined with cupcake liners, or other molds. I used Reynolds heart shaped molds, coated with cooking spray. Beware: sentimental post to follow. I am working on another project and have very limited access or time to the computer today, but I have been meaning to post this for quite some time now. When I started this site, almost 2 years ago, I had no idea my life would be altered forever by a handful of bloggers. All bloggers have different lifestyle, backgrounds, affinities. We sometimes click, we try to visit as many blogs as we can and try to leave as many pertinent comments or simple "hellos" here and there. Over the past year, I have become somewhat "internet" close to a few bloggers scattered all over the world. It is no wonder that they also happen to be Daring Bakers but we were already "regulars" on each other's blog prior to forming our (ever expanding!) group. About three weeks ago, there was a bad and nasty cloud over the Tartelette household. I shared this with those few bloggers, expecting a simple "sorry, thinking about you". Actually, I did not expect anything...I just wanted to tell them, I figured that if we shared croissant making and crepe cake inferno, that was just as good as washing our dirty laundry together! What I did not expect was the week long delivery of small packages, from all corners of the world, filled with as much diversity as the people who sent them. From handmade beauty products, to carefully selected chocolates, candies, sauces, and such. I tried to use some in my cooking, like a huge bottle of Dulce de Leche used to make cookies. I devoured 4 chocolate mice in one sitting and took only 2 days to drink too much Godiva hot chocolate and eat half a box of handcrafted chocolate...hmmmm.....Bloggers rock! I am not going to name anybody, they will recognize themselves. One day that I was scavenging for more chocolate I noticed a small yellow one from Michel Recchuiti on the coffee table. B. said it was "some sort of dried fruit dipped in chocolate". Yes, my husband is not very well versed in the world of chocolatiers, he's just happy to blindly follow me in my chocolate quests. The box contained Michel Recchiuti's Key Lime Pears: key lime juice kissed dried pears dipped in dark chocolate...! I had one by itself and immediately thought about using them in ice cream sandwiches. I made a batch of pistachio ice cream, sandwiched it in between the chocolate pears, thought about clling the neighbors and quickly changed my mind. I needed that much chocolate and sugar all by myself! Thank you again, my dear new and not so virtual friends. You were with me through the joy and the pain and I am here to do the same for you. I used the dried pears I had received but you can use your favorite cookies or it the ice cream by itself. In a large bowl, whisk the egg yolks and sugar until pale and thick, add the vanilla and pistachios. In a saucepan, on medium heat, bring the half and half to boiling point but do not let it boil. Freeze until firm and fill your favorite cookie or chocolate dipped dried fruit with it.